Choosing a web hosting company is the most important business decision you can make for your blog. Whether you are a beginner doing a WordPress blog or a company with a thousand web pages Krystal Hosting has a hosting package that’s designed to fit your style. This company offers 5 different hosting options that can meet anyone’s needs. If you are starting off small with a simple blog, you’ll always have the option to upgrade to another package as the needs of your website grow. Your free domain name will be included in your Topaz hosting package and can be chosen when you place your order. For the WordPress blogger who is just starting out, Krystal Hosting offers a wide range of tools to help you get started, and is especially good for the person who knows little about the Internet. The first thing you’ll need is the free WordPress program. This company has the latest free version of WordPress and through the use of the program Fantastico, it can be installed and running in a matter of minutes. A quick trip over to the WordPress website allows you to chose a free template from thousands of different designs. Once you’ve created your blog you’ll want to know how well it’s doing out on the Internet. Krystal offers customers a free web statistics package that lets you know how many visitors you’ve had, from what part of the world they are coming from and how much time they spent on your site. The company offers 3 different statistic packages for you to choose from. In time, when you want to add eCommerce to your site, the company offers 3 different eCommerce applications for you to use. Again, using Fantastico these can be automatically installed for you. In a matter of minutes you will be selling your product. Their servers offer the security you need to give your customers confidence in buying through your WordPress blog. 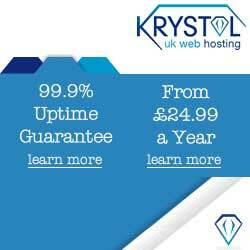 Krystal Hosting offers website owners the reliability they need in a web hosting company. With nearly 100% up-time you never have to worry about your WordPress blog being offline. The company is also honest enough that, if you can’t decide which hosting plan is best for you, they’ll walk you through everything and most likely recommend starting off with a basic package. Another thing that’s very impressive about their work ethic, is that they offer free hosting to any registered charity in the U.K. They also support different charities and use their resources to help with fund raising and awareness. Your website will be given unlimited email addresses and the company offers superior spam filtering so that only your “true” email gets through. You can even access your emails through their website when you are traveling. If you need your mail forwarded or you need to run a mailing list for your newsletter, they have the capabilities you need. Krystal protects your emails through their own anti-virus programs, so that viruses will never make it to your inbox. Overall, Krystal Hosting is one of the most impressive companies in business today, and their reputation was built through outstanding customer service.